We spent another 5 hours today canvasing every store imaginable for furniture/display pieces for the shop. Phew- it is an exhausting process and I am just not as adept at the furniture thing as I would like. Paper- I can do. I am good at paper. Furniture…well I struggle. 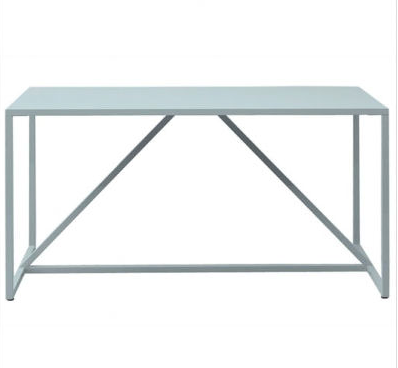 Here is the table we are considering for the bridal area, we particularly like it in robin’s egg blue, as shown below (you know- “something blue”). I am hoping the modern lines will contrast nicely with the vintage feel of the bench. Other than furniture, we were excited to hear that our order from Rifle Paper Co. shipped last week. I just love their work and think little miss Anna Bond is so talented. I noticed her stationery in Anthropologie today- so happy for her to have landed such a big account. It is well deserved. Anyhoo- hope everyone is having a wonderful weekend. I am off for some well deserved fun- wine included. Yay!